Banner stands come in many shapes and sizes, but the fixed pole (which also telescopes) tripod banner stands, which either has a tripod or round base, are one of the more versatile banner stands due to their ability to mount different size graphics both horizontally as well as vertically, plus tripod banner stands such as the Summit can also attach a literature pocket to the vertical pole under the bottom of the graphic. 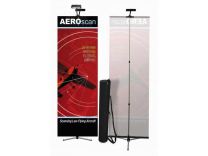 Tripod banner stands can also be a single sided or double sided banner stand as well. Don't forget to check out our trade show displays accessories for shipping cases for all our tripod banner stands and trade show displays at ShopForExhibits.com and see what great value is all about. Optima Graphics, who is a supplier of trade show display graphics for trade show exhibit distributors delivers their products and services in a unique manner than most. What do they do? Above all else, they understand your needs as a customer and as a business to business partner, and when accompanied with a long term business plan, helps over shadow the immediate challenges. Optimas' goal is to deliver both relationships to retailers in a manner that makes them the vendor of choice in each of their markets. By carefully planning not only future product roll outs, and keeping distributors informed of current trends, has allowed Optima the ability to make the relationship in the present, an pleasurable challenge. 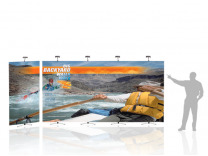 Years ago, it was Optimas' bold move into the Lambda printing technology which is used in photo murals for pop up displays, that really got everyone's attention in the display industry. Their new products in the pop up displays arena have been extremely innovative, well received in the marketplace, and giant sellers with all their distributors. Optima has certainly had a positive impact on the products that flow into the exhibit market. ShopForExhibits, a long time distributor of trade show displays, continues to broaden its' internet product lines with improved product offerings such as trade show flooring, and the exciting new exhibits in the custom modular hybrid displays line. By launching a new state of the art web site, ShopForExhibits plans to keep pace with future growth challenges by delivering to new prospects the knowledge and product information needed to build confidence in an expanding web retailing strategy. Faced with uncertain economic challenges, the web based trade show exhibit retailers such as ShopForExhibits, are working diligently to provide not only reasonable price points for their products, but exceptional values in terms of ways of visually imaging a companies message, to quickly move prospects to make a buying decision. Being successful in any business climate requires a level of superior product knowledge and selling skills in order to successfully be able to bring future generations of exhibit products such as silicone edge graphics, to the exhibiting business community.